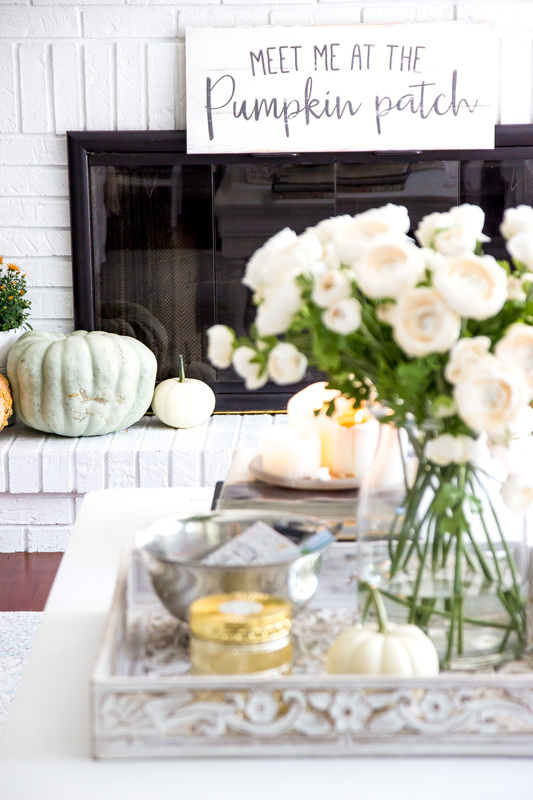 Fall has arrived in our living room! 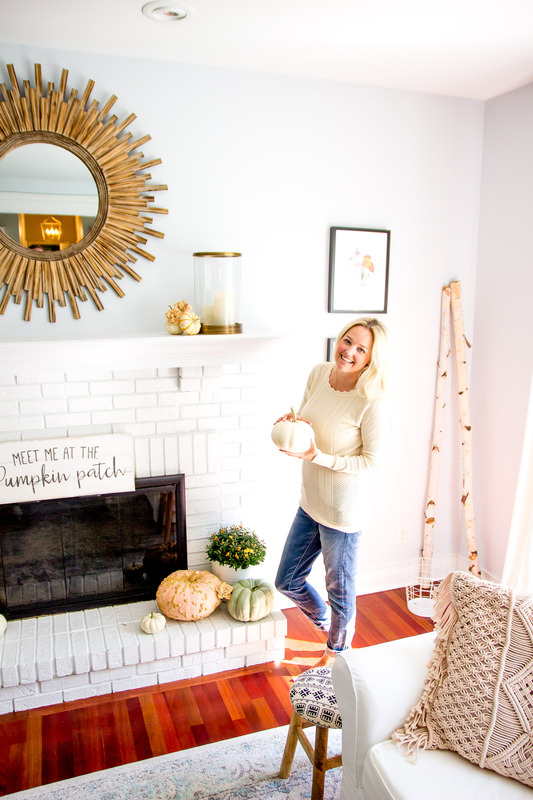 I had so much fun decorating for the Autumn season and excited to share some details….including my favorite coffee table accessory, a new lighting trick I’ve been obsessed with and hopefully some ideas to inspire your decorating this year! I’ve included a source list at the bottom which includes links to many items we’ve used in our living room. 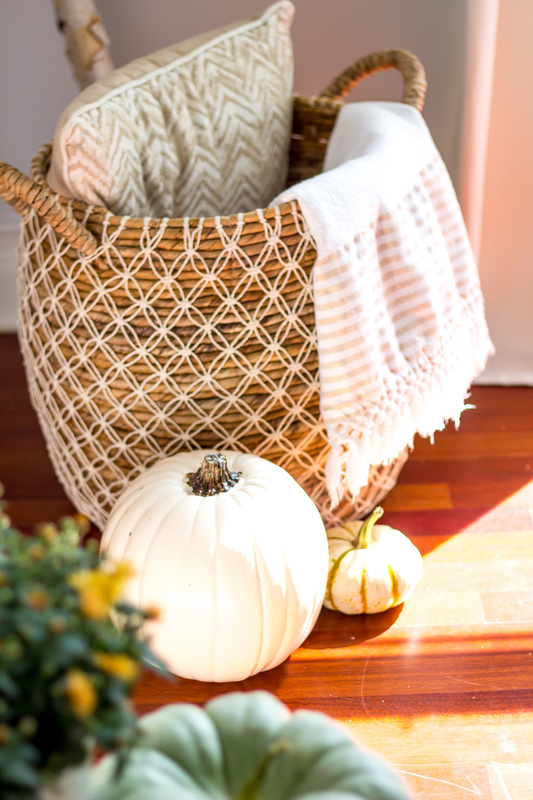 You’ll see some notes (including my favorite place to shop for baskets and pumpkins!) As always, feel free to message me with any questions too! An Antique Bowl for Memories. We have my grandmothers sterling silver bowl on our coffee table which we use to hold photographs of fun family memories. It’s fun for guests to look through and the kids love them too! I also keep these notecards that we can write Harper’s Milestone Memories on too. Lots of candles! 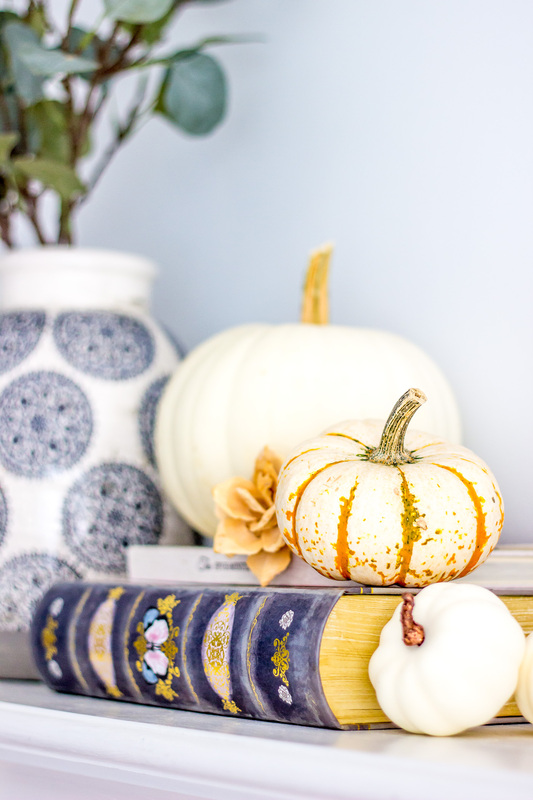 We usually have at least one candle out throughout the year but when fall comes around, we stock up! We also use a flameless flickering candle on our mantel which we use quite often. This is a great alternative to real candles if you are worried about forgetting to blow them out or have little ones! A tray. I found ours at Homegoods but I love using a tray to corral lots of things while still keeping the table look nice. Stack of Books/Catalogues. Since I’m often referring to catalogues for clients, this makes it convenient for me. I choose carefully which to display ~ only the ones that go with the color scheme in the room. The Restoration Hardware catalogues come in handy and are great for decor! I’ve gotten so many compliments on these flowers. They are from IKEA guys!! Aren’t they pretty? A little trick I learned from Joanna Gaines is to add water to the vase to make them look more realistic. I also love this vase (also from IKEA and linked below). It is glass but sturdy and wide enough that I don’t have to worry about it breaking or falling over with the kids. You know what they say about one persons trash is another persons treasure? My neighbor was saying goodbye to these wood flowers and she generously offered them to me. 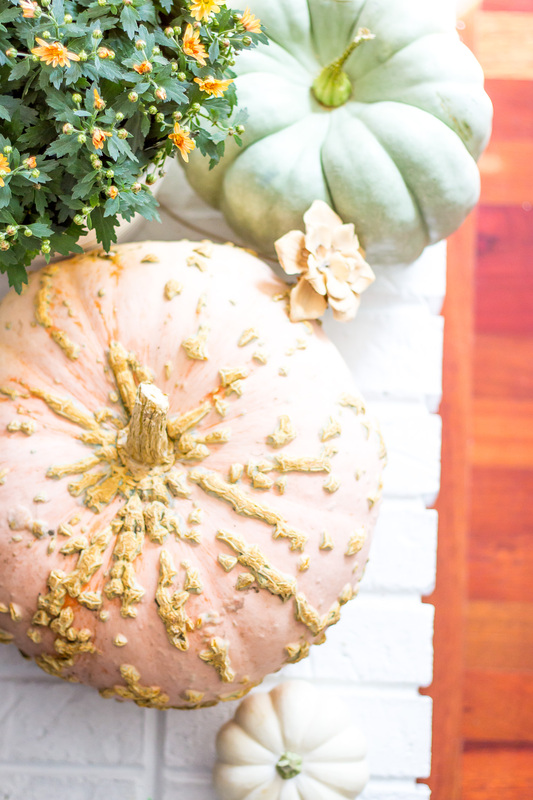 I love how they subtly add a little texture and pretty shape with the pumpkins. 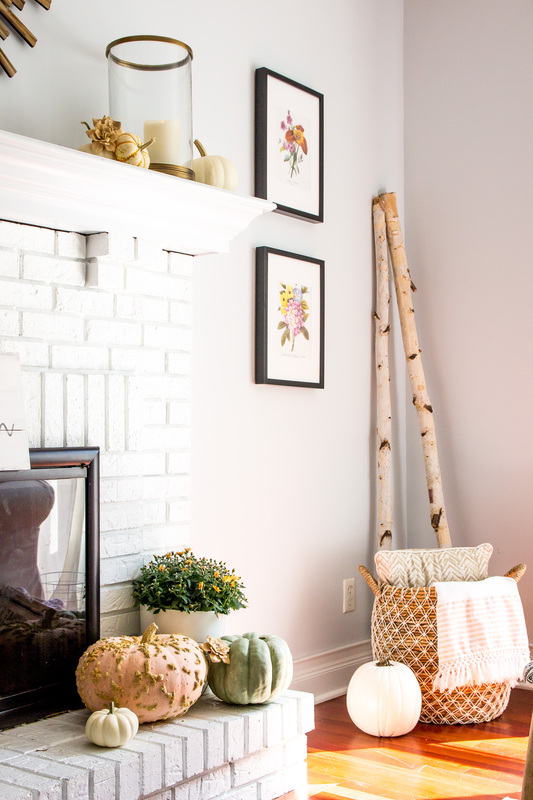 Full disclosure here – see that corner with the cute basket and birch wood? Well, normally we have a changing table there (so glam haha!). I switched it up just temporarily and created a little cozy corner with a basket filled with blankets and pillows. 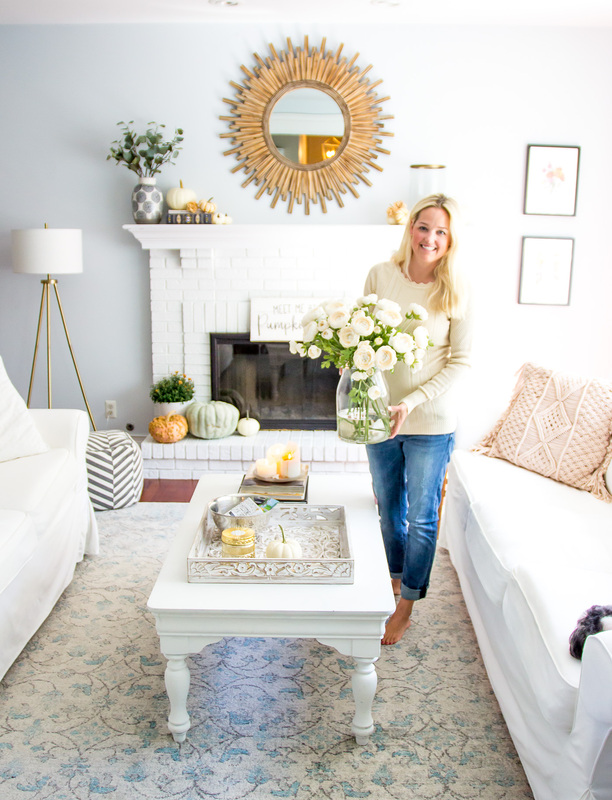 One of my favorite thing about decorating (and dressing) for fall is layering up! Bring out the sweaters, blankets and extra pillows. We also added a sconce!! That works beautifully. Without any electrical…. 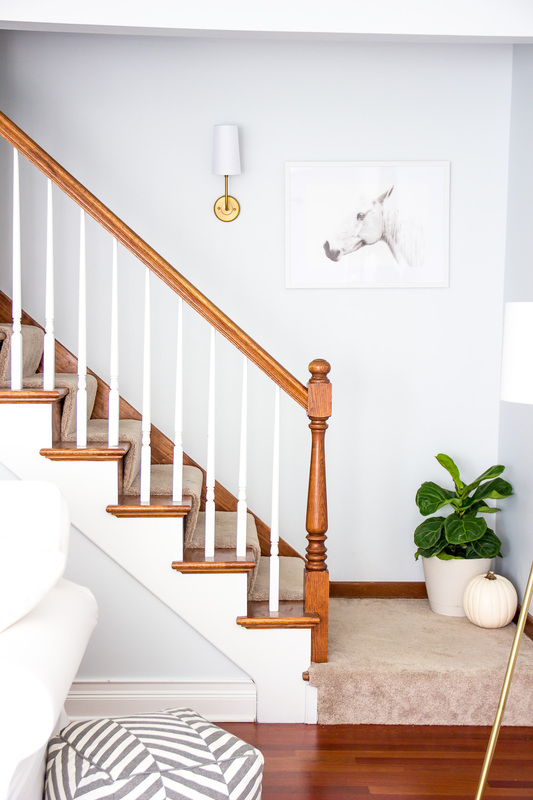 This is a tip I learned from Nesting with Grace where you add a puck light with a remote to a sconce vs. a light bulb. I couldn’t wait to try it and share it with my clients (and you too of course!). We bought these LED puck lights that came with a remote. You can also adjust the brightness. 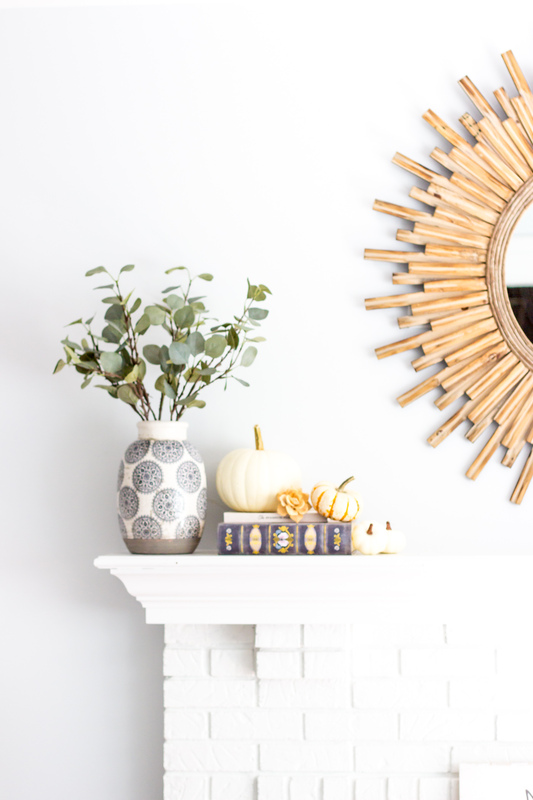 And this sconce which was on sale for only $23! The sconce currently 77% off the original price. You know how I love a great deal and this looks really nice in person too. I forgot to get a photo with the light turned on but when it’s dark, it lights up the whole staircase. 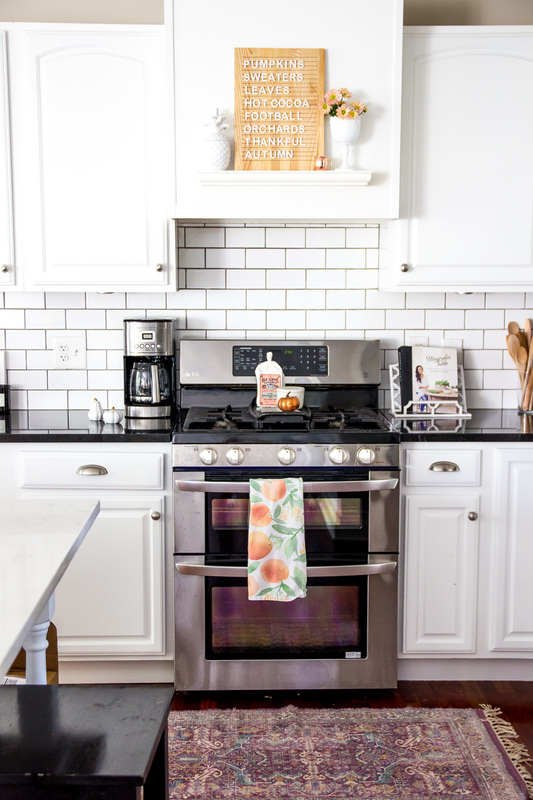 Here’s a little peek at our kitchen too! For awhile I resisted getting a letter board because they are so trendy but now that we have one, I absolutely love it. 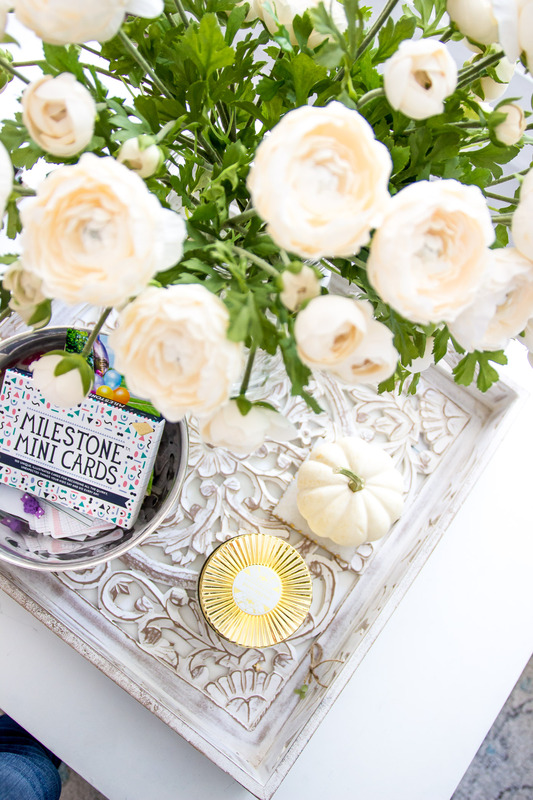 We mix up the sayings with inspirational quotes and fun things for the seasons and celebrations. Even documenting some of Harper’s milestones. Our letter board is the White Oak finish from Emmerie Lane. 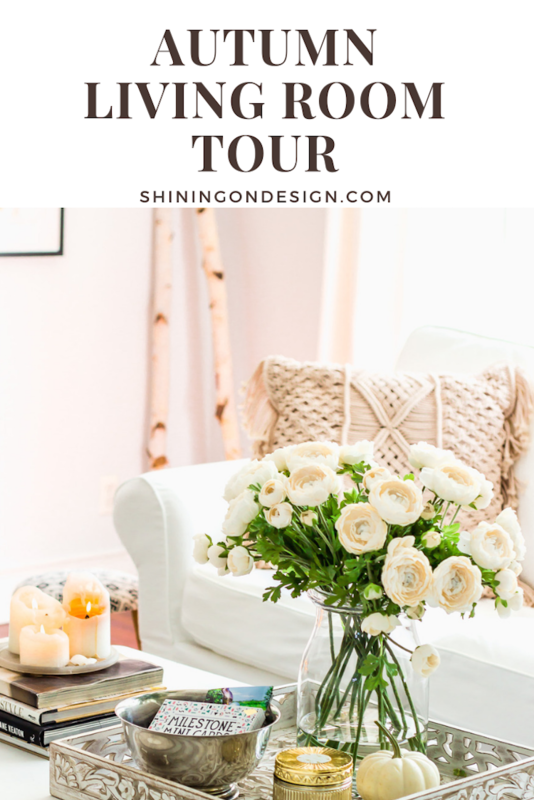 Thanks for joining me for this Autumn living room tour! Normally there are a million toys, baby bouncers and things everywhere so don’t be fooled by these pictures. Last week I hosted a small “spa” night for some neighbors so the living room was actually almost toy free for a day- which means I got the camera out while it lasted! Thanks Angelica! I started early this year ~ just couldn’t wait! 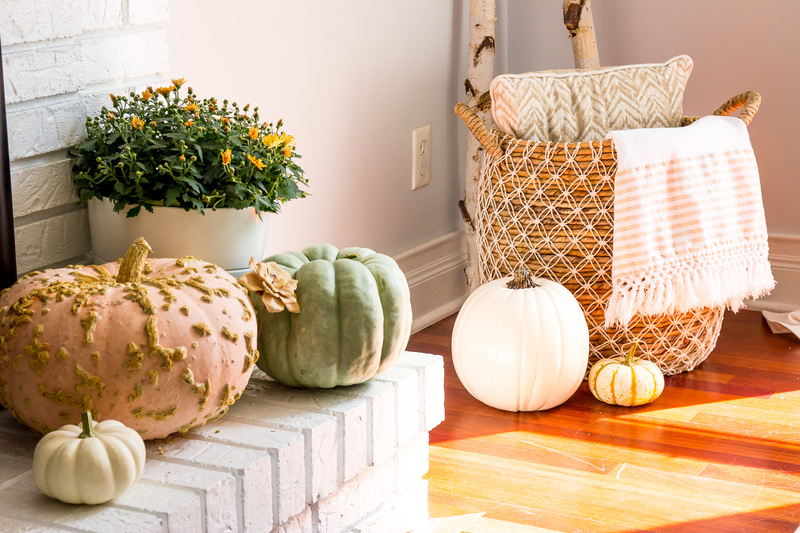 So pretty your home is gorgeous for the fall. Simple, chic and beautiful just like you. Aw Jen, you are the sweetest! Thank you! This is soo cute! I love the color palette! Thanks Megan! I usually plan out the color palette but winged it this year and it worked! 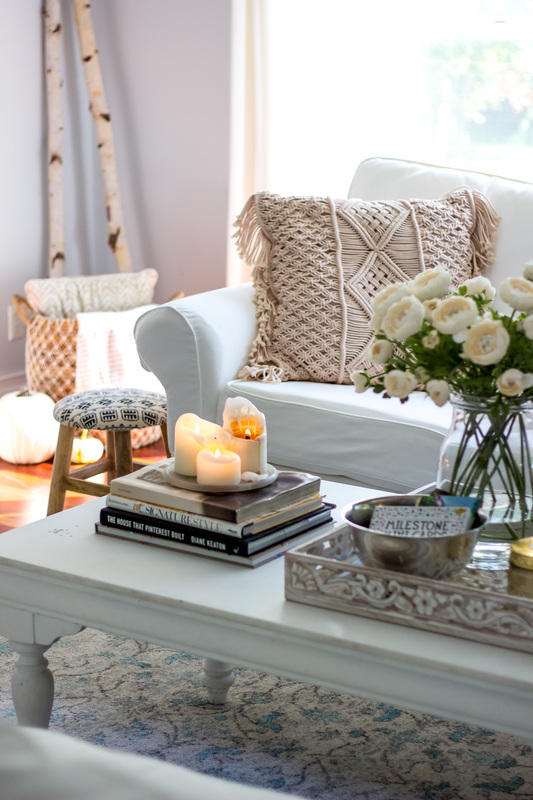 I love the simplicity and the use of neutral colors. 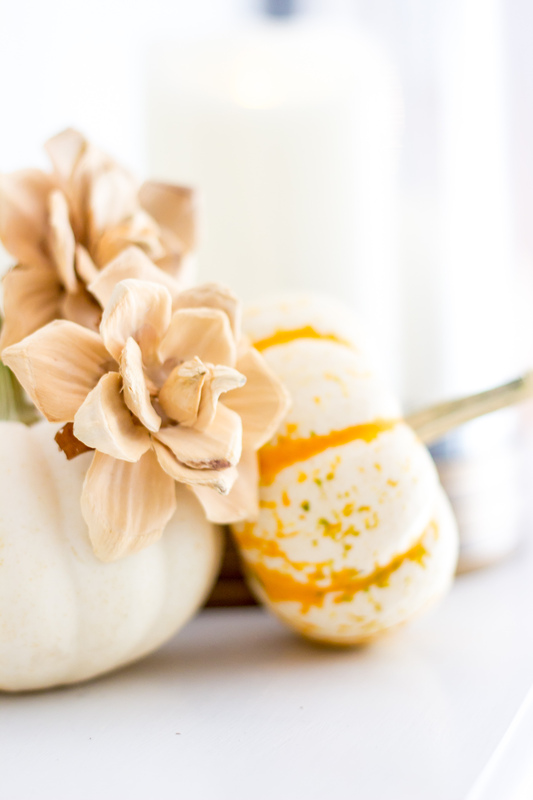 Your pumpkins blend in so well with your other decor instead of sticking out like huge bright orange blobs. Hahaha! Yes, you don’t want those things sticking out like blobs! I absolutely love those colors! 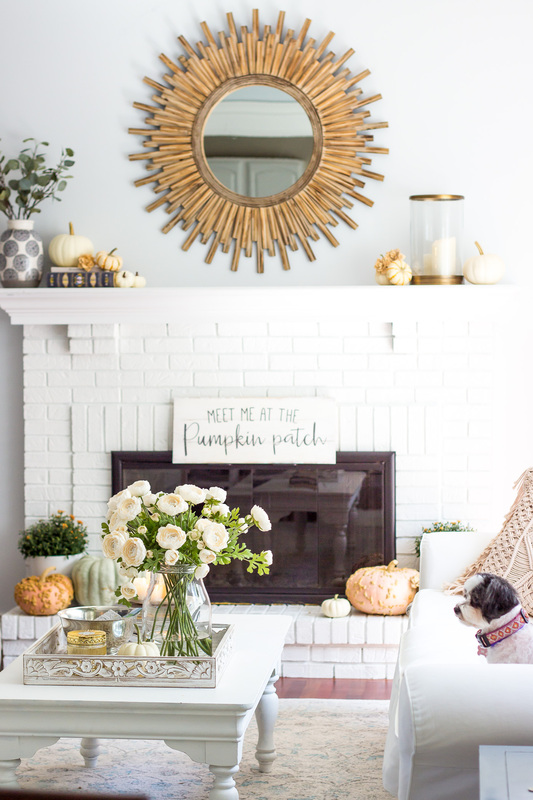 It’s also great to redecorate for the season change but also keeping staple pieces! Couldn’t agree more Bree! Thanks so much! Gorgeous, simply gorgeous! 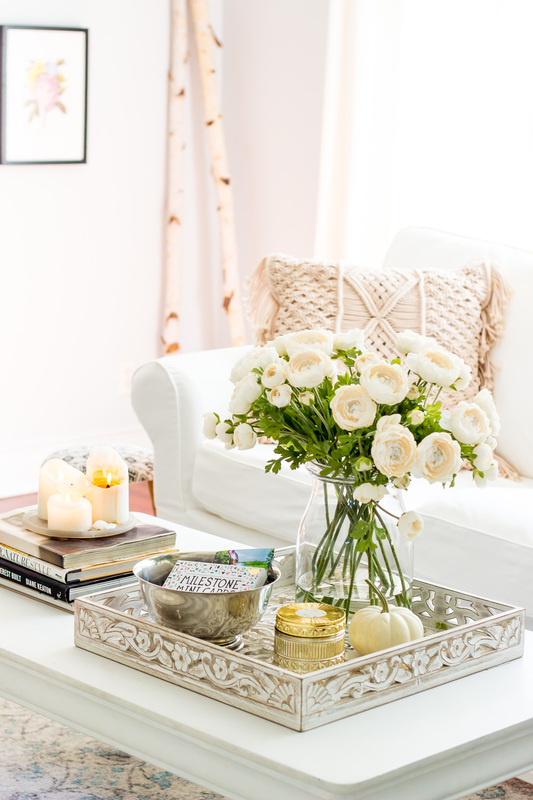 Love the water with the faux flowers tip… gonna steal it! Thanks Tana! It’s a good tip! I try to remember not to have the faux stems sit in the water too long. I’ve read mixed things on this so it may be best just to use this trick when entertaining (or for photos! ).